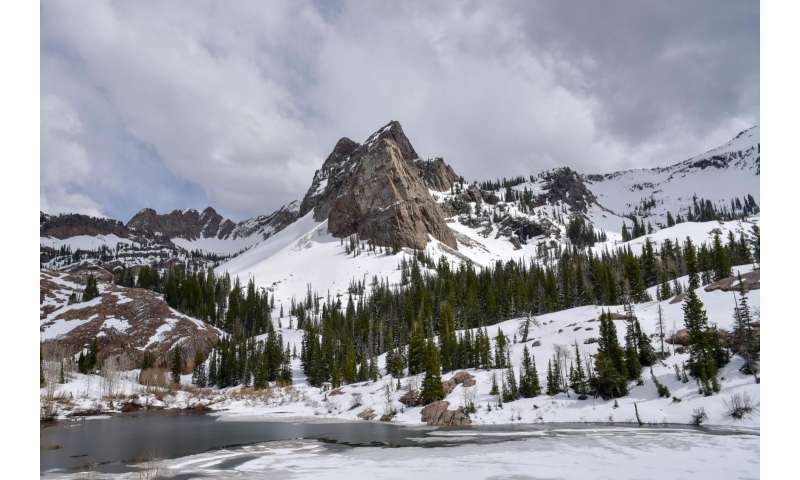 Sundial Peak, in the Wasatch Mountains, with Lake Blanche (elevation 8920 feet, 2718 meters) in the foreground, May 2016. Credit: David White. The study, accepted for publication in Geophysical Research Letters, models the year-to-year variability in precipitation and temperature in Utah's Wasatch Mountains and other ranges in the West. Jason Scalzitti, a graduate student in atmospheric sciences, and professors Court Strong and Adam Kochanski found that above a threshold elevation, the amount of spring snowpack is dependent more on the amount of precipitation in a year than the temperature. In other words, whether a year is wet matters more than if it's warm. But below that threshold, temperature matters more. By the end of the century, according to the study, that threshold will move uphill by around 800 feet in the Wasatch and more in the Sierra Nevada, Cascades and parts of the Rocky Mountains. "In the past we've thought mainly about total precipitation as an indicator of how good the ski season's going to be," says Strong. "As we move into the future, especially at elevations below the threshold, temperature increases in importance." Strong and his colleagues based their work on a high-resolution, regional-scale climate model called the Weather Research and Forecasting (WRF) model. Conventional climate models make calculations on grids 62 miles (100 km) on a side. For reference, less than 20 miles separate Salt Lake City, west of the Wasatch, and Park City, Utah, on the east. "You can't even see the Wasatch Range at that resolution," Strong says. Although the coarser grid of global climate models works well in flat topography, such as the Great Plains, the complex terrain of the Intermountain West requires a finer resolution. The researchers employed a technique called "dynamical downscaling," telescoping the model grid into smaller and smaller grid cells in order to capture fine-scale atmospheric processes affecting local climate. In the team's final simulations, the Wasatch Range was modeled at a resolution of about 2.5 miles (4 km) to realistically capture impacts of the range's slopes, canyons, and peaks on the local precipitation pattern. They further accounted for future temperature changes in the Great Salt Lake and evaporation from urban irrigation, both of which contribute moisture to the air. The team projected regional future climate forward to the year 2100 using a business-as-usual carbon emissions scenario that assumes greenhouse gas emissions will continue to increase at the same rate as today. In the simulations, modeled threshold elevations rose in mountain ranges all over the West - by about 800 feet (250 meters) in Colorado's Rockies, about 980 feet (300 meters) in California's Sierra Nevada and Washington's Cascades and more than 1400 feet (432 meters) in the middle Rockies of Idaho and Wyoming. An overall warming trend doesn't mean that every year will be a bad year for low-elevation resorts. But below the threshold elevation, resorts will more susceptible to warm years. "Let's say we get the same amount of storms every year," says study co-author Kochanski. "Above the threshold, the resorts will probably be fine. For the others, even if we have the same precipitation, they may be in trouble because they could get more rain instead of snow, and the snowpack will diminish faster." Although impacts to ski resorts could affect Utah's economy, another implication of diminished snowpack affects nearly all Utahns - shrinking water resources. Melting spring snowpack fills reservoirs, providing water for the residents of the Salt Lake Valley. Spring snowpack amounts are a key indicator for water managers of how much water they'll have available in reservoirs for the coming year. "They look at that as how much water is available in the form of snow to melt and capture in the reservoirs," Strong says. "That will be down in the future. Even if we have the same amount of water coming into the system, it will be melting earlier and faster. If we want to supply that to a growing population, then we need increased storage capacity."